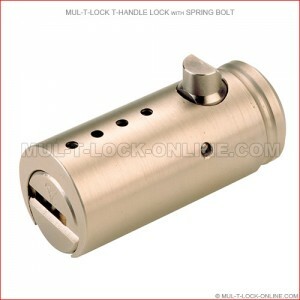 MUL-T-LOCK's T-Handle Locks will retrofit popular T-Handle sleeves which are used to protect Vending Machines. Strategically placed hardened steel inserts, which are designed to hold up to some of the most determined attempts of physical attack MUL-T-LOCK's T-Handle Lock will fit just about any vending security requirement. Incorporated with MUL-T-LOCK's patented Interactive Key Control System to gives the user one the highest levels of key control available in the market today.